On 17 January, the surviving units of 45th Indian Brigade, with the Australian 2/19th and 2/29th Battalions serving as reinforcements, were dispatched to re-capture Muar. They rallied around Bakri and organised a rough perimeter defence of it. Their commander, Brigadier Herbert Duncan, planned a three pronged advance from Bakri to Muar; up the main road between the towns, from the jungle island, and along the coast road. The attack went wrong before it could be launched. The brigade ran into one of the Japanese ambushes, and the counter-offensive was cancelled. The next day at 0645, General Nishimura ordered his own three-pronged attack on Bakri. It was spearheaded by nine Type 95 tanks under Captain Shiegeo Gotanda. 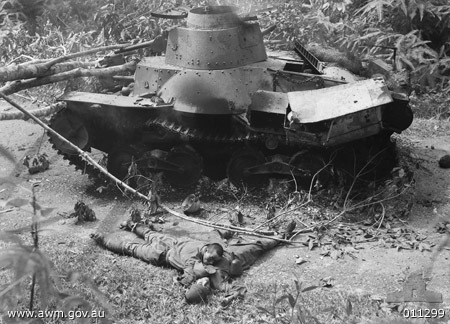 However, Captain Gotanda, inspired by the Japanese tank's success at Slim River, advanced without infantry against the 2/29th Battalion, and was wiped out. 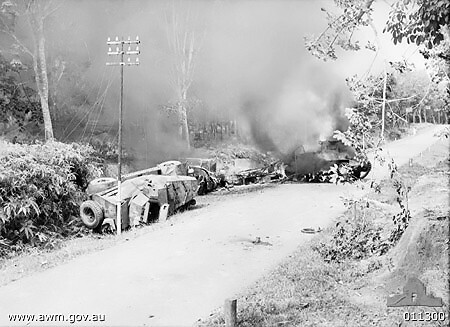 In a repeat performance of the Australian gunners at Gemas, Lieutenant Bill McClure's two anti-tank guns (also from the 2/4th Australian Anti-Tank Regiment) destroyed all nine of Gotanda's tanks. Sergeant Clarrie Thornton, commanding the first gun received a Mention in Dispatches, and Charley Parsons, commanding the second gun was awarded the DCM. Thornton's gun fired over seventy rounds during the engagement. Lt Col James Robertson (commander of the 2/29th Australian Battalion) was killed soon after this engagement. Deprived of tank support, the infantry were unable to break through, an engagement Nishimura later described as "severe and sanguinary". By dawn the Japanese were in action on the main road, nearly surrounding the brigade. The 6th Norfolk Battalion of the 53rd British Brigade, who were assigned to defend a ridge about 5 miles West of Yong Peng, covering the line of retreat for the 45th Brigade, feared they would be annihilated in the now practically-encircled area. Early in the afternoon of 19 January, a Japanese raiding force attacked and drove them off the ridge. 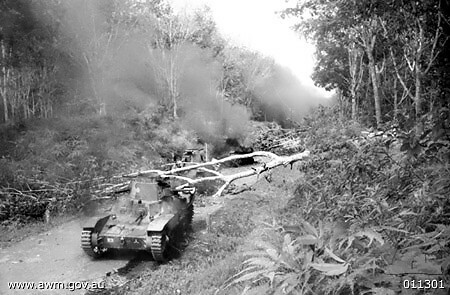 The British retired up through the thick jungle to the summit of the northern ridge. The Norfolks were unable to inform headquarters of their position as they had no wireless. At dawn of 20 January, the 3/16th Punjab Regiment, commanded by Lt Col Henry Moorhead (who took part in Operation Krohcol), were ordered to recapture the ridge. By the time they reached it, they came under friendly fire from the Norfolks, who had mistaken them for the Japanese. After losses on both sides, it was later sorted out. But before a proper defence could be organised, the Japanese attacked, killing Moorhead and driving both the Norfolks and Indian troops off the hill. The 45th Brigade and the two Australian battalions at Bakri were now in danger of being cut off. That same day, Brigadier Duncan, who had recovered from his concussion and was commanding the rear guard, was killed when he led a successful bayonet charge to recover lost vehicles. With Duncan and Robertson dead, Lt Col Charles Anderson assumed full command of the 45th Brigade and all other units around Bakri. Early in the morning of 20 January, Anderson was ordered to pull out from Bakri and attempt to break through to Yong Peng. Anderson decided to delay until the 4/9th Jat Regiment could reach the column. During this delay most of the 2/29th Battalion were cut off from Anderson's position. Only an estimated 200 men from 2/29th Battalion and 1,000 Indian troops from the 45th Brigade were able to join up with Anderson's column. Other survivors from the 2/29th would make it back in small fugitive parties. Within a mile or so of Bakri Anderson's column were held up by Japanese roadblock. Several efforts to break through failed, until a bayonet charge led by Anderson himself was successful. More roadblocks lay ahead for the brigade. By sunset, after a struggle which had raged on throughout all the hours of daylight, the column had covered a distance of three miles. Anderson warned that there was to be no rest that night, and ordered the march to go on. The brigade had now reached the edge of some more open country and passage was easier, though the column, by now, was laden with wounded. The young and inexperienced 45th Indian Brigade had ceased to exist as a formation. Most of its officers were killed or wounded, including Brigadier Duncan and all three battalion commanders. In the space of a few days Percival had lost an entire Indian brigade and the best part of two of his Australian battalions as well as one brigadier, three Indian Army battalion commanders and an Australian battalion commander. Two battalions from the 8th Australian Division were despatched as reinforcements: the 2/29th and the 2/19th Battalions. The Indian brigade was pushed back towards Bakri where, north of the village, the 2/29th and some gunners of the 4th Anti-Tank Regiment provided blocking action. Japanese forces penetrated between the 2/29th and the 2/19th at Bakri. The 2/29th had to fight their way back to Bakri.